For more than 20-years, Jack Black has provided men with easy to use and highly effective facial and skin care products. Our Pure Clean Daily Facial Cleanser is a 2-in-1 facial cleanser and toner that removes deep-down dirt and oil for clear, smooth, shave-ready skin. Utilizing our PureScience formula, which are free of synthetic colorants, fragrances, and parabens, our Pure Clean Daily Facial Cleanser leaves your skin hydrated, clean, and fresh. This product can be used in the morning before shaving, and at night to cleanse your skin. Jack Black products are easy to use, and carefully formulated with high-quality ingredients to be highly effective. 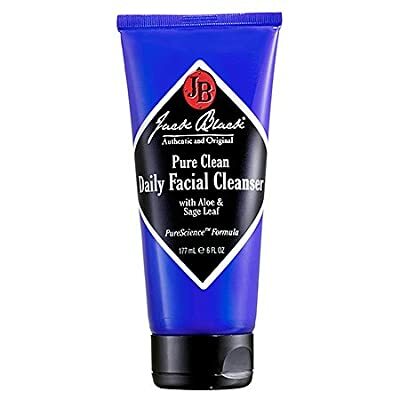 Our Jack Black Pure Clean Daily Facial Cleanser contains multiple natural ingredients that work seamlessly to remove deep-down oil and dirt, while leaving your skin clean, smooth, and hydrated. Oat and Coconut natural, sulfate-free surfactants dissolve pore-clogging residue, dirt, and oil. Organic Sage Leaf Extract is known for providing antibacterial and anti-inflammatory benefits. Chamomile Extract is combined to sooth, calm, and helps reduce redness by acting as an antiseptic. Rosemary Extract helps control oiliness and helps fight bacteria on the skin’s surface, while Witch Hazel acts as a toner and anti-irritant. Organic Aloe Leaf Extract helps soothe, calm, and soften the skin. Every Jack Black product is dermatologist tested, paraben free, cruelty free, and free of harsh surfactants. Almost all products in our line are vegan, free of artificial colorants, safe for sensitive skin, and made in the USA. If clean, smooth, and hydrated skin is important to you, Jack Black Pure Clean Daily Facial Cleanser is a product you can trust.